How Much Does Stone Siding Installation Cost? Stone sidings, just like brick sidings, add glamor and strength to your home. With most of the homes in the US made of timber, adding the strength of stone, be it a veneer or the real thing, will definitely improve your home’s durability. While most people understand the stone siding installation concept, very few understand how much it will cost to install stone siding and what actually determines these costs. We are going to evaluate the different stone siding installation cost determinants and help you come up with the best cost estimate for your project. How Much Will It Cost To Install Stone Siding? 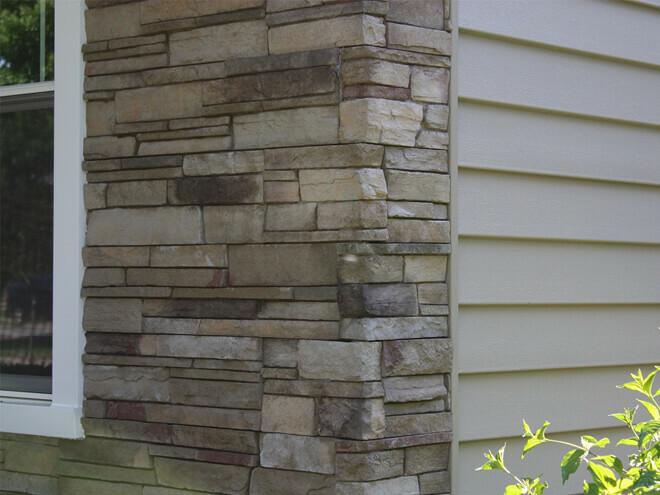 The cost to install stone siding will depend on the type of stone or veneer you choose to use. Exotic or rare stones will be costlier to source as opposed to readily available stones. A stone veneer, though cheaper than the actual stone, will vary in cost depending on its thickness and quality. Expect to spend anything between $1500 and $20000 per 1000 square feet on your stone siding installation. This big variance accounts for the huge cost difference between using stone siding veneer and the real stones for your project. Statistics show that the average homeowner with a subtle balance of tastes and preferences could spend about $8800 on a stone siding installation project. Always get multiple quotes from different contractors to ensure that you get the best value for your money. This will increase your chances of getting the best stone siding installation regardless of your budget. The material is the greatest contributor to the stone siding installation bill. Even though the bill will vary depending on your local market forces, you should expect to spend between $8 and $20 per square foot. Supportive products like mortar to bond the stones and grout to seal the joints are mandatory. Expect to pay up to $450 to buy sufficient grout and mortar for a 1000 square foot project. The final concern would be the labor charges. These will vary depending on your location and the demand for masons and carpenters. The average rate should be around $70 per hour. A good contractor will use 25 to 40 hours on a 1000 square foot project. Can Your Home Support the Siding? The stone siding installation will put additional stress on your home’s foundation. You will need an expert to inspect your walls and foundation before moving on with the project. This could determine the thickness of the veneer or stones you use or prompt you to install a metal lath to accommodate the extra weight. If you have to prepare the area for the siding, you will have to set aside some money for the extra labor costs. You can never make stone siding installation a DIY project. Actually, you might have to hire extra casual laborers to help fast-track the project. Simply enter your zip code in the space provided on this page for accurate information regarding your area and the related cost of stone siding. You'll get a no-obligation, 100% FREE estimate which is a great way to decide what will be possible given your budget.